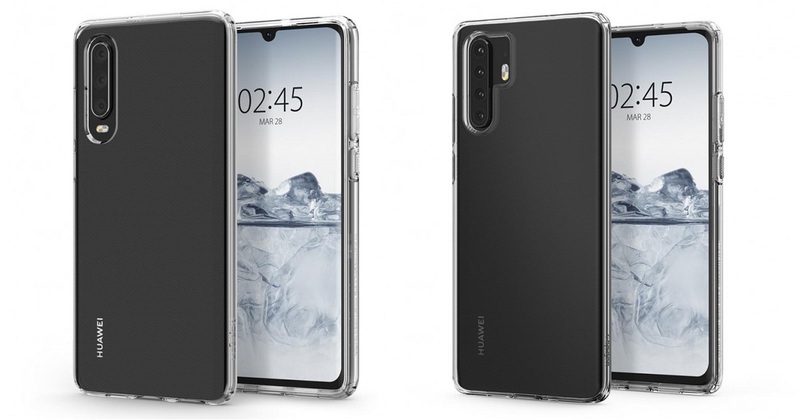 Spigen, a case maker, has released several images showing cases for the upcoming Huawei P30 and P30 Pro. This would not be as interesting had they not included renders of the phone itself. On the back, both phones will have vertically aligned cameras, with the P30 having 3 cameras and a dual LED flash, and P30 Pro having 4 camera sensors. With the P30, the LED will be below the camera setup, almost at the same place where the 4th sensor sits in its big brother. The P30 Pro will also have a dual LED flash, but it will be located next to the setup, towards the middle of the phone. On the front side, renders don't reveal too much. It's interesting to see this gorgeous display though – it will be quite large with only a tiny water-drop notch on top and a very small chin at the bottom. Side and top bezels are virtually non-existant. It's also nice to see that Huawei will stick to implementing a 3.5mm audio port into their P series smartphones for at least one more year. There's one more interesting thing on these images. All renders display the same time and date – 2:45, March 28. Huawei is expected to release the P30 lineup towards the end of March, so we believe that we're looking at the exact launching date here. The event will most likely happen at an event in Paris, and most probably we won't be seeing another phone release before that event. However, the company will have a big announcement to make at the MWC 2019 where they will talk about their foldable phone and 5G technologies.